This complete porcelain dinnerware collection of beautiful depicted Andre Renoux Parisian Interior Restaurant images was the last collection completed before André Renoux passing in 2002. 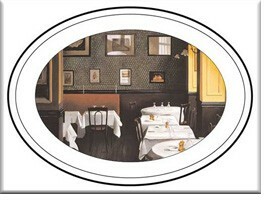 Spanek Enterprises thanks the Sur La Table company for creating and launching this gorgeous classic commerative collection in time.The series/special collection of four restaurant images is reproduced from André Renoux's original artwork onto glazed porcelain plates and platters. The name of each restaurant is printed on the back of each item. They are finished with a stylish fillet on the rim. CLICK ABOVE or ON THE PICTURE to the left to view a larger image of the plate design. Plates are dishwasher and microwave safe. However, to preserve their original color and collectible features, we recommend hand washing. HANG THEM ON THE WALL when you aren't setting your table with them! Both sets have the same images. Dinner plates available separately. 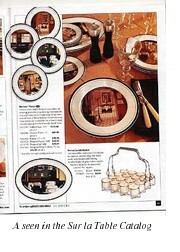 Dessert plates available only as Dinner/Dessert set. CLICK ON THE IMAGE OR TITLE FOR A CLOSER VIEW . . .
A must to add to your plate collection. The image is of Chez Allard II in Paris as painted by André Renoux.